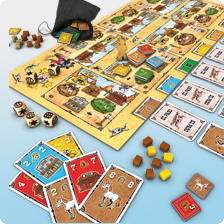 El Paso is a push-your-luck game where players are cowboys who are trying to loot towns and get away before the sheriff arrives. The players loot 7 towns one after the other. Each town contains loot tiles which each display one of 6 loot types (cattle, gambling, horse, cash, saloon, gold) and a number from 1 to 5. Each turn a player either commits to a turn of looting, or moves on to the next town.